BRITISH petroleum additives firm Infineum yesterday officially launched a new US$150 million (S$187 million) chemical plant on Jurong Island. This is Infineum's first Asia-Pacific plant making calcium salicylate - a vital ingredient in oil products used in cars and marine equipment, for example. The 2-ha facility is the firm's biggest single investment in the world to date, and its second on Jurong Island. It has been up and running since early last month. 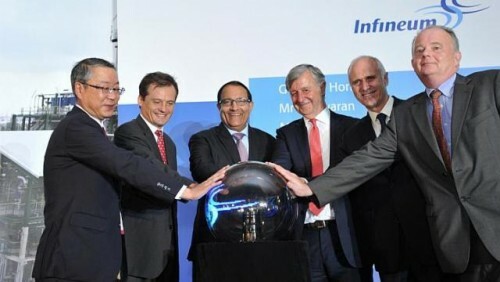 In a statement, Infineum said the new plant is an important addition to its global supply capability for additives, with an "integrated manufacturing process" comprising computer-automated operations and in-line systems to govern equipment functions. It employs nearly 200 staff, of whom 95 per cent are Singaporeans and permanent residents. While production rates were not disclosed, the project's venture director Xavier Leleux said the plant was producing up to design expectations. Infineum chief executive Xavier le Mintier said the firm aspires to expand its position as a "global leader in the transportation additive industry". "Today we have made a major step in that direction by bringing together the most advanced technology, process design, and best talents, here in the Asia-Pacific region, here in Singapore," he said at yesterday's on-site opening. Mr Eugene Leong, energy and chemicals director at the Economic Development Board, said the new facility will "entrench Singapore's leadership position in the market" both in the Asia-Pacific and globally. "This investment builds on the strong foundation of the energy and chemicals industry... further differentiating Singapore as a location for knowledge intensive technologies." This is Infineum's only manufacturing site for salicylate, apart from a plant in Berre, France. Its other Singapore facility has been making lubricant and fuel additives since it was built in 1982 on then Pulau Ayer Chawan, now part of Jurong Island. The new plant marks a milestone in the firm's Asian expansion. Just last month, it signed a lease agreement for a business and technology centre in China's Shanghai, and also started construction of a new blending plant in Jiangsu province. Mr S. Iswaran, Second Minister for Home Affairs, and Second Minister for Trade and Industry, said the plant is well-placed to serve the "burgeoning demand" for fuels and lubricants in the region. "Urbanisation, demographic trends and the growth of the middle class will translate into an increase in Asia's demand for chemical products... (and) expanding consumption will drive growth in marine traffic, and correspondingly, an increased demand for marine fuels," he said at the event. Mr Iswaran also said talks had been finalised for Dutch oil giant Vopak to develop a liquefied petroleum gas (LPG) import facility on Jurong Island, in partnership with South Korea's SK Gas, with an initial capacity of 80,000 cubic m.
The LPG facility, set to be completed in the first quarter of 2016, is part of the government's Jurong Island version 2.0 initiative, a project which aims to extend the island's position as a global energy and chemicals hub. Jurong Island houses about $42 billion worth of investments from companies including giants Shell and ExxonMobil, and is a key part of Singapore's $99-billion-per- year chemical sector.